Victorian architecture dates from the second half of the 19th century, when America was exploring new approaches to building and design. Advancements in machine technology meant that Victorian-era builders could easily incorporate mass-produced ornamentation such as brackets, spindles, and patterned shingles. The last true Victorians were constructed in the early 1900s, but contemporary builders often borrow Victorian ideas, designing eclectic “neo-Victorians.” These homes combine modern materials with 19th century details, such as curved towers and spindled porches. A number of Victorian styles are recreated on the fanciful “Main Street” at Disney theme parks in Florida, California, and Europe. This style was largely inspired by the Utopian ideals of two Englishmen, John Ruskin and William Morris, during the late 1800’s to 1910, who believed that living among handmade objects of natural materials would have a humanizing effect on society. 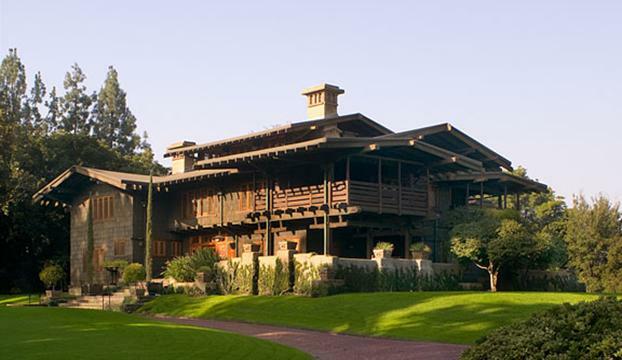 These two architects were influential in the Craftsman, Mission, and Rustic styles and Frank Lloyd Wright’s early works. Their principal tenets of functionality and organic, sustainable methods and materials are still highly influential today. The notable features of this style included the use of local stone and brick, Rustic, stone-dressed doorways and windows; Open porches; Projecting eaves; Overhanging rafters; Large windows with leaded-glass decoration, Large, square chimneys; Exposed construction; Intricate, crafted joints; Asymmetrical plans. This style flourished in mid-nineteenth century America, made possible by the advent of the steam-powered scroll saws that were used to create the elaborate ornamental woodwork. Notable features include pointed, steep intersecting Gothic gables; Pointed-arched windows; Cupolas and towers, Asymmetrical floor plan; Large verandahs; Opulent applique work, scroll work, pinnacles, finials, barge boards, moldings, balustrades, and stick work: Intricate paintwork. 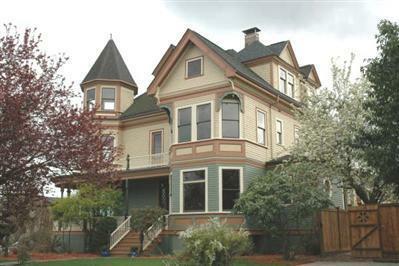 The Carson House in Eureka, CA is said to be the most photographed Victorian House of this style in the United States. 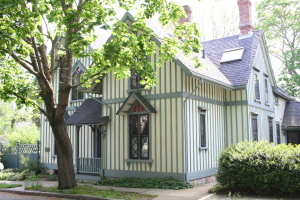 The influence of English romanticism and the mass production of elaborate wooden millwork after the Industrial Revolution fueled the construction of Gothic Revival homes in the mid-1800s. These picturesque structures are marked by “Gothic” windows with distinctive pointed arches; exposed framing timbers; and steep, vaulted roofs with cross-gables. Extravagant features may include towers and verandas. Ornate wooden detailing is generously applied as gable, window, and door trim. Other notable features include: Pointed arches over doors and windows; Interior Vaulting; Tall Turrets; Pinnacles; Leaded Glass. American architects Alexander Jackson Davis and Andrew Jackson Downing championed Gothic in domestic buildings in the 1830s. Most Gothic Revival homes were constructed between 1840 and 1870 in the Northeast. 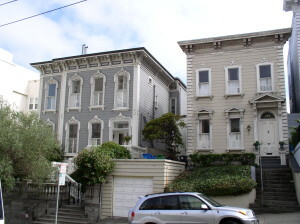 Italianate homes, which appeared in Midwest, East Coast, and San Francisco areas between 1850 and 1880, can be quite ornate despite their solid square shape. Features include symmetrical bay windows in front; small chimneys set in irregular locations; tall, narrow, windows; and towers, in some cases. The elaborate window designs reappear in the supports, columns, and door frames. More notable features: Overhanging eves with decorative brackets; Windows arched or curved at the top; Windows aligned in threes; Low pitched or flat roofs; Center front facing gables; Arcaded porches with balustrade balconies. A sub-style of the late Victorian era, Queen Anne is a collection of coquettish detailing and eclectic materials. Steep cross-gabled roofs, towers, and vertical windows are all typical of a Queen Anne home. Inventive, multistory floor plans often include projecting wings, several porches and balconies, and multiple chimneys with decorative chimney pots. Wooden “gingerbread” trim in scrolled and rounded “fish-scale” patterns frequently graces gables and porches. Massive cut stone foundations are typical of period houses. Created by English architect Richard Norman Shaw, the style was popularized after the Civil War by architect Henry Hobson Richardson and spread rapidly, especially in the South and West. Other notable features include: Large porches along exterior walls and many overhangs and wall projections. 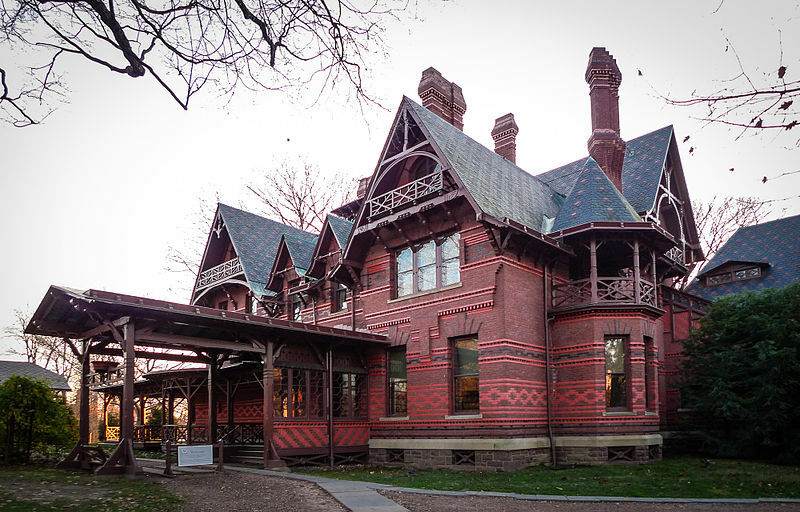 Popular in the Midwest and Northeast, this Victorian style was fashionable for public buildings during Ulysses S. Grant’s presidency, but its elaborate, costly detail fell out of favor in the late 1800s for economic reasons. Second empire homes feature windows, molded cornices, and decorative brackets under the eaves, balconies and bays. One subtype sports a rectangular tower at the front and center of the structure. Notable features include high mansard roofs with rounded cornices, wrought-iron cresting, dormer windows projecting from the attic, cupolas, patterned slate roofs, classical pediments and paired columns, and small entry porches. This American style originated in cottages along the trendy, wealthy Northeastern coastal towns of Cape Cod, Long Island, and Newport in the late 19th century. Architectural publishers publicized it, but the style was never as popular around the country as the Queen Anne. Shingle homes borrow wide porches, shingles, and asymmetrical forms from the Queen Anne. They’re also characterized by unadorned doors, windows, porches, and cornices; continuous wood shingles; a steeply pitched roof line; and large porches. The style hints at towers, but they’re usually just extensions of the roof line. A steamboat Gothic house is resplendent with gingerbread scroll work, latticework, and trellises – like the fancy steamboats that were once a frequent sight on the Ohio and Mississippi Rivers. Notable features include Pointed, steep intersecting Gothic gables; Cupolas and towers; Battlements; Asymmetrical floor plans; Opulent applique work, finials, barge boards, balustrades, stick work, and moldings; Gingerbread scroll work, lattice work, and trellises; Intricate paintwork; Emphasized verticality; Grand wrap around porches and verandas, metal smokestack chimneys. A fine specimen of Steamboat Gothic is the Mark Twain House, Hartford, Connecticut. A member of the Victorian family, the Stick house boasts a lot of detailing. However, few Stick homes incorporate all the possible features. Typical characteristics include gabled, steeply pitched roofs with overhangs; wooden shingles covering the exterior walls and roof; horizontal, vertical, or diagonal boards–the “sticks” from which it takes its name–that decorate the cladding; and porches. You’ll find traditional sticks in the Northeast and their sister, the Western Stick, in California. The Western Stick is rectangular with sliding glass doors, a small chimney, and large panes of glass. 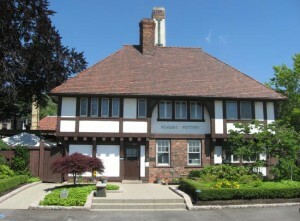 This architecture style was popular in the 1920s and 1930s and continues to be a mainstay in suburbs across the United States. The defining characteristics are half-timbering on bay windows and upper floors, and facades that are dominated by one or more steeply pitched cross gables. Patterned brick or stone walls are common, as are rounded doorways, multi-paned casement windows, and large stone chimneys. A subtype of the Tudor Revival style is the Cotswold Cottage. With a sloping roof and a massive chimney at the front, a Cotswold Cottage may remind you of a picturesque storybook home. 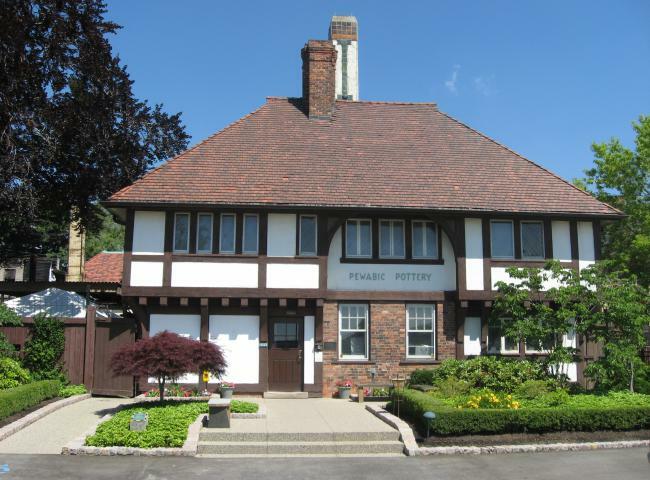 Refer to the Pewabic Pottery Building in Detroit, MI, designated a National Historic Landmark in 1991.